Father Charles Dahm is a dyed-in-the-wool activist, following in the footsteps of old-school, firebrand Catholic priests. He has never shied away from an opportunity to challenge authority or hesitated to speak his mind. But he says it is always in service of a single goal: bringing about a more just and peaceful world for all, in other words, putting his faith into action. “I take a principle from Thomas Aquinas that every act is a political act. 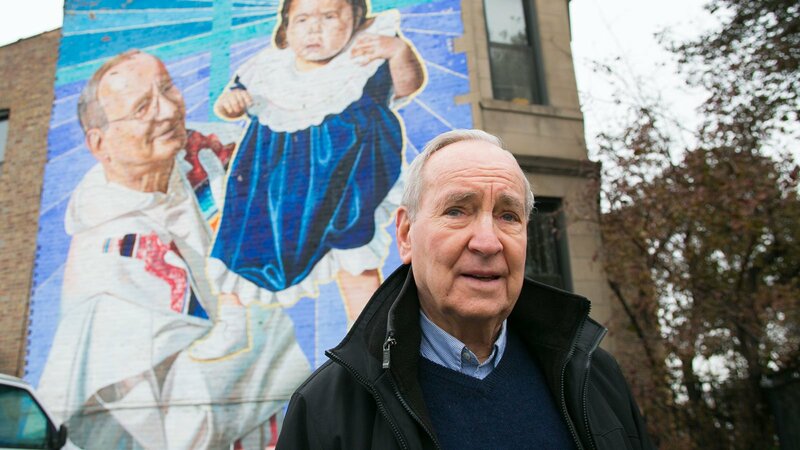 Even if you don’t do anything, that’s a political act,” he said from his office on South Ashland Avenue in Chicago’s Pilsen neighborhood, surrounded by images of Cesar Chavez, Oscar Romero, and Rudy Lozano. Since 1986, he has served as pastor or associate pastor of St. Pius V Church, across the street. “You can stand by and watch things happen, or you can try to make things better,” he said. He says he’s been arrested during political demonstrations more times than he can count for acts of civil disobedience, such as occupying a senator’s office, blocking doorways in the Federal Building in downtown Chicago, and dyeing the Chicago River red to draw attention to the bloodshed in El Salvador in the ‘80s. Back then, he was a key Midwest organizer for the sanctuary movement and helped shuttle hundreds of Central American refugees through a national underground railroad of sorts to safe havens in the U.S.
His began his career as an instigator at a young age in suburban Elmhurst, where he grew up. But he was always devout. Even as a young boy, his parents never had to wake him up to attend mass. In fact, more often than not, it was his idea to go – even during the week. Father Chuck entered the Dominican seminary at the age of twenty. He had to break off a relationship with his high school sweetheart to pursue the priesthood. He spent his early years as a Dominican working with university students in the Bolivian city of Cochabamba and later in La Paz, the capital city. He chose the assignment. It was an electrifying time to be working with young idealists in Latin America, he says. In Cuba, Fidel Castro had just taken power and was implementing broad social reforms. Meanwhile, in Bolivia, activists were fighting to restore the gains of that country’s short-lived, 1952 leftist revolution. In 1970, a small cadre of Bolivian students began to suspect that the Dominicans were agents of the U.S. government and that Dahm himself was a CIA agent, so the Dominicans called him back to the U.S. Wanting to develop the tools to better analyze and influence systems of oppression and power, he enrolled in the political science program at the University of Wisconsin in Madison and began work towards his doctorate. He moved to Chicago in 1973, where he found the subject for his dissertation, which eventually became his book on the power dynamics in the Chicago Archdiocese. That same year, he was elected to be the promoter of justice and peace for his Dominican province. Rather than work alone, he rallied clergy and women religious from throughout the Chicago area and co-founded the 8th Day Center for Justice. Named after St. Augustine’s belief that humanity is in the “everlasting eighth day” of creation, in which the role of believers is to help usher the world into its intended peaceful and just state, the center worked internationally as well as at home in the United States. They challenged apartheid in South Africa, fought to reduce the proliferation of nuclear weapons in the U.S., and held corporations accountable for union busting, strip mining, discriminatory labor practices, and other human rights violations around the globe. Father Dahm also became a regional point person for the national sanctuary movement, which at that time was helping thousands of Central American refugees flee violence in Guatemala and El Salvador. He co-founded the Chicago Religious Task Force on Central America, which became the national headquarters for the movement and eventually organized 423 different sanctuary hubs across the United States. His radical politics, combined with his criticism of church hierarchy, earned him a reputation in the Chicago Archdiocese. And so, Father Dahm moved to Pilsen and became pastor at St. Pius V.
The Pilsen that Dahm entered in 1986 was very different than the one that exists today. Neighborhood gangs were splintering and battling for territory. Homes were dilapidated and overcrowded, the rental market dominated by slumlords. City services like garbage pick-up and street sweeping were sparse and inconsistent. “The place was filthy,” Dahm recalls. Meanwhile, Dahm says he found a prevailing attitude of resignation at St. Pius V. Parishioners tended to hold traditional Catholic beliefs, such as believing that suffering in life is a virtue. As pastor of St. Pius V, he got to work challenging these ideas and promoting an incarnational theology, one which sees Jesus’s time on Earth as an affirmation of human dignity and which calls upon believers to cooperate with the Holy Spirit to usher in the kingdom of God on Earth. That, he says, requires active engagement. Raul Raymundo, a lifelong congregant at St. Pius V, said that in 1988, he was 22 years old and was home on a college break when he attended one of his first masses with Father Chuck. He remembers Dahm giving a sermon about a young man who had been shot across the street from the church. He credits Dahm with reigniting his Catholic faith and helping him make the connection between his religious commitment and his commitment to his community. He wasn’t the only one. Soon, Dahm formed a social justice committee at St. Pius V, where parishioners gathered to pray, study the Bible, and reflect upon specific challenges in their neighborhood, focusing on how to tackle them in order to create a community based on their values. He gathered the priests from five other neighborhood congregations and suggested they do the same at their own parishes. In 1990, those six local priests each pledged $5,000 in seed money and sent one representative from each church to formally launch the Catholic Community of Pilsen, a grassroots community organizing and development organization. It soon became The Resurrection Project, and Raul Raymundo, the only college graduate among them, became its leader. Today, their efforts have grown into a multi-pronged organization that provides affordable housing to more than 844 families, offers loans to new business owners, and helps connect immigrants, homeowners, new entrepreneurs, and others with services and channels for political engagement. They recently expanded their programs to Back of the Yards, Little Village, and the suburb of Melrose Park. Father Charles Dahm blesses new, affordable homes acquired and rehabbed by The Resurrection Project in Chicago’s Back of the Yards neighborhood in August 2013. Courtesy of Father Charles Dahm, O.P. “None of us saw how big this could possibly get,” said Dahm. Dahm has remained involved and on the board, but says he has always felt strongly that the organization should be independent from the churches and the whims of parish priests. In the meantime, he has continued to take his message of community engagement to the Pilsen community, holding masses to bless areas where violence has taken place and becoming actively involved in or co-founding several other Pilsen-based organizations, including the Chicago Workers’ Collaborative, an advocacy organization for day laborers; San Jose Obrero Mission, an interim shelter for men and women; and Parenting 4 Non-Violence, which helps parents in areas experiencing violence learn effective strategies for keeping their children safe. Father Dahm poses with labor and civil rights leader Dolores Huerta at St. Pius V in 1998, officiates mass in the streets of Pilsen circa 1997, and visits with Zapatista Subcomandante Chico in Chiapas, Mexico, in 2002. Courtesy of Father Charles Dahm, O.P. Much of his work has been identifying, inspiring, and training leaders – at St. Pius and elsewhere – to do that work of challenging structures and empowering people. One of them is Alma Silva, who has been a member of St. Pius V since shortly after she moved to Pilsen from Mexico more than twenty years ago. Today, Silva is a full-time immigrant rights organizer. “It’s Father Chuck’s fault,” she says with a smile. One of the main tenets she says Dahm has helped her understand is the difference between social service, which she considers the more traditional approach to community engagement, and social justice, which requires an element of personal and community empowerment. Over the past decade, Dahm has focused much of his energy on tackling another unpopular topic. He says the church’s position on domestic violence is often misunderstood. Victims are not expected to remain in abusive relationships simply in order to honor their vows. He works to raise awareness of the pervasiveness of the problem and to connect survivors with support, regardless of what they decide to do for themselves and their families. Working with a social worker at St. Pius V, he has also developed a program that offers individual and group counseling to victims, children, and abusers. Together, they created the largest parish-based domestic violence program in the United States. Dahm stepped down as head pastor of St. Pius V in 2006 so that he could take what he has learned at St. Pius V and transfer it to other parishes. Since that time, as the first-ever Archdiocesan Director of Domestic Violence Outreach, he has preached about the issue at weekend masses at more than 118 parishes and has helped launch parish domestic violence ministries in 85 of those communities. He believes social justice issues shouldn’t be sidelined but ought to be at the center of church life. He finds like minds in the United States Conference of Catholic Bishops, which takes very specific political positions. They recently criticized President Donald Trump’s withdrawal from the Paris Climate Accords, opposed efforts to repeal the Affordable Care Act, and countered the specifics of Republican-led tax reforms. They have long supported DACA, or Deferred Action for Childhood Arrivals, and a host of other measures that would help undocumented immigrants obtain more rights and security. Dahm points to the radical teachings of Jesus as an example for Christian leaders to follow. Dahm still encounters apathy and doubt. But he refuses to budge. Father Chuck Dahm speaks outside a day labor agency during a protest of their treatment of day laborers in May 2013. Courtesy of Father Charles Dahm, O.P. “I’m dying here. I’m not going anywhere, if I can help it,” he said. He’s embraced that culture and wrote a book in 2004, Parish Ministry in a Hispanic Community, to help other non-Hispanic priests learn from his experiences. Father Charles Dahm receives the Saint John XXIIII Award in recognition of priestly dedication to Hispanic ministry from Cardinal Blase Cupich at the Midwest Conference Center in Northlake, Illinois, in September 2015. Courtesy of Father Charles Dahm, O.P. He also studied various elements of Mexican culture and created space at St. Pius V for incorporating such traditions as posadas during the Christmas season and ofrendas during Dia de los Muertos. But there is one cultural tenet in Pilsen’s largely Mexican community that has always resonated with him and been part of his worldview.